I finally managed to watch the ‘Bill Cunningham New York’ documentary this weekend. I’d been meaning to buy the DVD for a while, and then, joy of joys, I found it on Sky Anytime. I do sometimes think that on-demand TV has changed my life. Anyway, onto Bill. What an incredible story and what an incredible man. I already knew of his legendary status as pretty much the world’s first street-style photographer but what I hadn’t appreciated was the utter single-minded way he approaches that life. Living in a tiny, bathroom-and-kitchen-free studio in the legendary Carnegie Hall (at the time of the documentary; all the artists have since been sadly evicted) his main furniture is rows of filing cabinets filled with the negative of every photo he has ever taken. And he’s taken a lot. Working for decades on the streets of New York, photographing everyone from young hipsters to Lady Astor, Bill Cunningham has developed relationships with some of his subjects over many years. Even Anna Wintour says that people dress with Bill in mind. Although I firmly believe that every aspiring fashion blogger should be made to watch this documentary, we can all learn something from him, not just the people aiming to be the next Scott Schuman, aka The Sartorialist. Who is really emulating Bill Cunningham, it seems, anyway. As someone who flits shamelessly from one interest to another, the completely blinkered approach he has to life is completely alien to me, and yet amazingly compelling. Even living in Manhattan, he has an ascetic, almost monastic life. 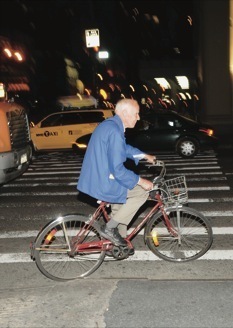 Shunning other things such as fine food or music, or even interest in clothing for himself, (preferring to wear the same kind of blue jacket as the street cleaners) Cunningham rides his bike from one New York society event to another, photographing all evening. Then he’s up in the early hours of the next day, on the streets. In his own words, there are no short-cuts. Just many, many hours of graft. I was completely struck throughout the documentary by his decency. Parting company with Women’s Wear Daily because he didn’t like the way they used his images to criticise people, he seems to be such a genuinely good person, believing that if you don’t take money from people, they cannot dictate to you – even if that means you have to walk away from work. He doesn’t use his images to mock or ridicule, but only to celebrate the joy that is fashion. In an industry that can be horribly bitchy, this is a wonderful truth. I suppose he can be summed up by the words of the French Minister for Culture at the time he was presented with the Legion D’honneur in Paris. I’m paraphrasing, but the essence of his speech was that Bill really didn’t believe he deserved such awards, and that really summed up why he did deserve them. He credits his success to his subjects, rather than his own eye for style. Although on their own, his images are not considered iconic shots, as a chronicle of style, they cannot be bettered. Ok, Going to watch this after your stellar reccomendation…like to watch things that people are passionate about :). I really do love it. He’s an incredible character.